Please note that packets are normally bought in rather than made up here. Larger packets may contain shade and perforation varieties as listed by Gibbons, unless listed as 'face different'. Condition of modern mint items within packets is normally mint fresh but used examples can vary, particularly older stamps, which are now becoming very scarce, even the 'common' ones. Some thematic packets contain some stamps that are unlisted or appendix listed in Gibbons, although these will usually be the 'usual suspects' ie Arab States, Paraguay, some ex-Soviet 'states' etc. (Interestingly these issues have a growing number of collectors and some once common and neglected material is now becoming scarce!) 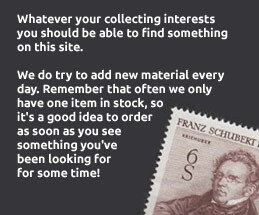 This doesn't of course apply to the classic stamp collecting nations and areas, as such material has never been produced for them! If you are ever unhappy about the quality or nature of the stamps within a packet, bearing in mind the above, we are always happy to refund.